Clicking the Resource Info tab within a User Profile will bring User Managers to a window like the following. Only User Managers have the option to visit this screen. Default Burden Rate is the default hourly rate for the user's cost. Default Bill Rate is the default hourly rate for billing the resource's work. While it may be determined that the above-mentioned burden rate is best maintained here at the resource level, billing rates may differ on a project and/or contract basis and may be better managed within projects and contracts. Further information to help determine the best methods for calculating work rates can be found starting in the Work Rates Overview topic and following the relevant links for more detailed information on calculating rates as it pertains to your particular organization. Percent Allocation is the percent allocation of work defaulted to the user when assigned to a new project. This value may be changed on a project-by-project basis. More information on usage of this value and changing it at the project level can be found in the Add Resources to Projects section. Percent Utilization is the percent of the resources workday which is their percent utilization. Capacity Percent is the percent of the resources workday that they are available for projects. Capacity Percent Max used to generate an auto-alert if the max capacity is set and exceeded. Work Schedule Inherits From is the work schedule default the user will inherit from the system Default Work Schedule(s). Project Sponsor sets the resource as one which may be selected for project assignment as a sponsor in the Project Add Project - General form so that reports may be generated based on projects sponsored by this user. Resource Types/Roles sets the resource's roles (often thought of as skill sets) in the database for reporting and suggesting the resource for corresponding resource type/role assignments on specific tasks. Resource Type/Role Default selects the default role for the resource for reporting. 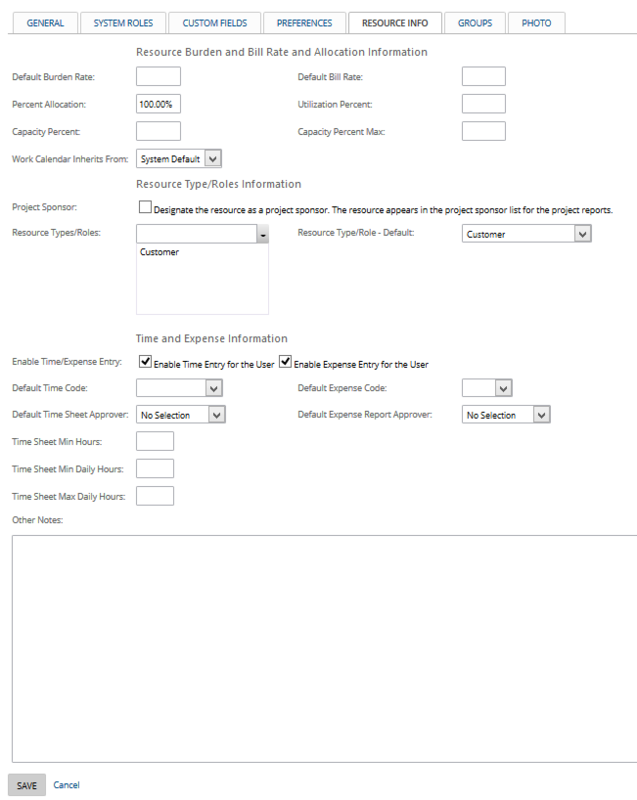 Enable Time/Expense Entry sets the ability for the user to enter time and expenses. Default Time Code sets the time code for the user's default if no other rules are present. Other rules which may override this default are the time code default by resource type/role for a task and/or the last entry time code used by this user. Default Expense Code sets the expense code for the user's default if no other rules are present. Other rules which may override this default are the expense code default by resource type/role for a task and/or the last entry expense code used by this user. Default Time Sheet Approver sets the user who will be assigned as the default whenever a time sheet is submitted for approval. Based on the Time Entry Sheet Settings, the default approver may be the only approver the user can select upon submitting a time sheet. If the user is set as their own approver, the user will have the option to automatically approve their time sheets upon submission. Default Expense Report Approver sets the user who will be used as the default whenever an expense report is submitted for approval. Based on the Expense Settings, the default approver may be the only approver the user can select upon submitting an expense report. If the user is set as their own approver, the user will have the option to automatically approve their expense reports upon submission. Time Sheet Min. Hours sets the minimum hours required for all submitted time sheet entries. Time Sheet Min. Daily Hours sets the minimum hours required for each day submitting time sheet entries. Time Sheet Max. Daily Hours sets the maximum hours allowed for each day submitting time sheet entries. Other Notes is used as a free-form text data field for any additional notes to maintain with the resource's data record. These notes are visible to all users in the Directory.